A myriad of juicy citrus hop aromas and flavors envelope your mouth. Every time we brewed an Imperial IPA you asked for more. 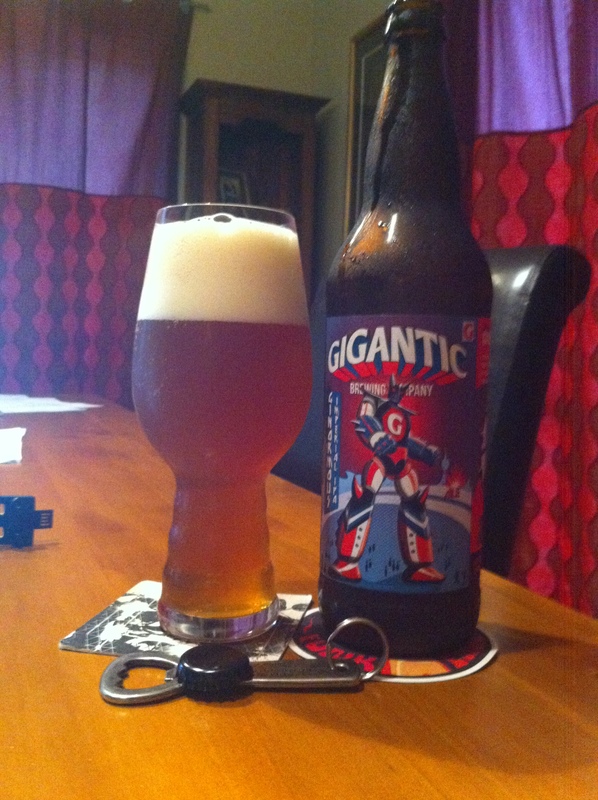 So we put our brewing skulls together and formulated the ultimate mecha Imperial IPA. We present to your olfactory zones Ginormous Imperial IPA. Available year-round. Developed in a secret testing facility deep in S.E. Portland, Ginormous is powered by seven mighty hops. His mission is simple; to deliver a massive hop punch to those in need. Definitely not a bitter IIPA, just enough to balance the sweetness of the alcohol. On opening no mistaking a high grass hop aroma there. Pour is light chestnut brown, and I proved I have poor skills as I got a head like a ice-cream soda, but I could smell the aroma as I poured, it’s divine. A closer sniff gives a bunch of malt sugar sweetness and a more muted grassiness. Like it calmed down a bit. Not the head that will take ages to calm down. Good gravy. That has a lot going on immediately, 3 or 4 things all have a clamour for attention, sweet, sour, sugar, bitter, smooth and sharp. I;m going to sit back and try again in a bit. There is a sudden and creeping dryness at the back of this, just thought I’d mention in passing until I’m brave enough to go again. So, that all calms down a bit second time up, although the malt does hit a peak as the stand out note this time, it’s unusual the way it does that. The to nose aroma is great. The bitterness, isn’t all that bitter, it is being constrained. The dryness is just the dryness. Warms up more and gets more, if I could use it, oaky, to describe the roughness that creeps in in the middle. Almost certainly the wrong way to describe the flatness that you taste. Which would be the malt thing, which seems to be the core of this beer concoction. As I ponder and drink more I get less enthusiastic. That would be change go styles and exceptions. Too much malt man. The gap between expectation and delivery is of course the disappointment. Are they bad things? Not at all, it’s interesting to have a beer that starts as one thing, gives you A, then B, then C, and still ends up quite drinkable and enjoyable. Memorable is the missing bit. The gap in the beer. The pdubyah-o-meter rates this as 8 a of its things from the thing. All in all a bit good, and somewhere to aim at if you wanted to make a good dIPA. I thought though that not quite spectacular and awesome as it could be, as I thought, and it’s just me, that this might be too malty, which kind of dulls it down a bit. Too sweet, by just enough to be enough to make you under if it really was a good idea. Am I enjoying it? I started off really liking it and waned as I got more into it. Would I have another? I would love another, there is nothing like a good hop forward beer with great aroma to tickle your fancy. Would I share with a friend on a porch and set the world to rights? Can’t see why not, this is well regarded and the amount of taste things I got would indicate that it should appeal to a lot of people. Super Band, who was I kidding, in a pop rock kind of way I ended up listening to “First Aid Kit”, you can here. First Aid Kit is a Swedish folk duo. Klara Söderberg sings and plays guitar. Her older sister Johanna sings backing vocals and plays keyboards. 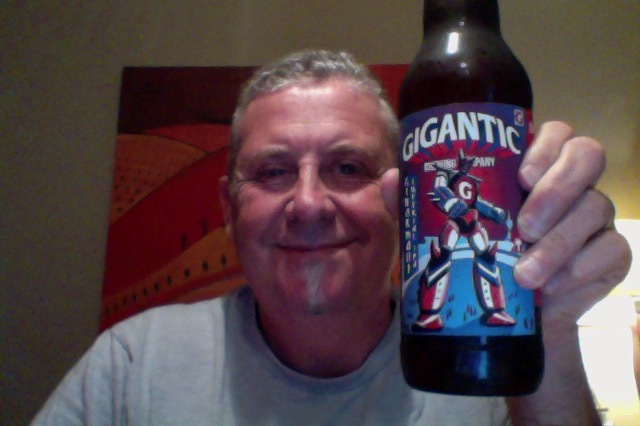 This entry was posted on April 2, 2015 by Philip Walter in Beer, Beer of the USA, Beer Review, Craft Beer, Critic, Gigantic, Imperial/Double IPA and tagged Alcohol by volume, Beer, Beer Review, Gigantic Brewing Co, Gigantic Ginormous, India Pale Ale, Microbrewery.